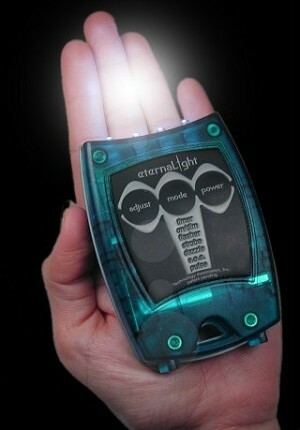 EternaLight(tm) Model 4Z - "EliteMax"
This is our most advanced, efficient and powerful pocket flashlight ever! The EliteMax, like the EliteXRay, is crafted in a translucent blue super-strength polycarbonate case, with a black and silver color scheme. Not only is it unique and attractive, it's nearly indestructible! 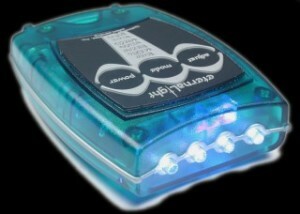 Featuring Overdrive, advanced microprocessor control features, power regulation, battery test and our exclusive NightBeacon(tm) function for nighttime locating. 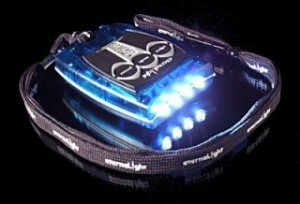 The EliteMax is the most complete definition of personal lighting instruments. The EliteMax comfortably fits in the palm of your hand. It comes equipped with lithium batteries for water buoyancy, maximum extreme temperature performance and shelf life. 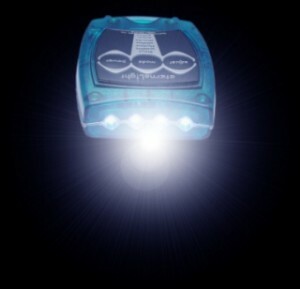 The EliteMax is built with a more powerful microcomputer and controlled power regulation which permits the most flexible power utilization of any flashlight ever made! Over 1,000 hours of continuous use without changing or charging the batteries and up to 100,000 hours of LED bulb life. It also features our exclusive inverted membrane for maximum tactile feedback and all the standard EternaLight smart series features like a timer, dimmable settings, a flasher, a strobe, SOS and other effects. Besides being the most advanced, the EliteMax(tm) is the most compact, powerful, durable, dependable, versatile and unique flashlight ever made! Provides smart features like: Instant Momentary Overdrive, Auto-off timer, dimmable settings, variable rate flasher, variable rate strobe, SOS, attention getting effects, 4 level battery status indicator and more! See our PDF On-line manual for more operational features and details. 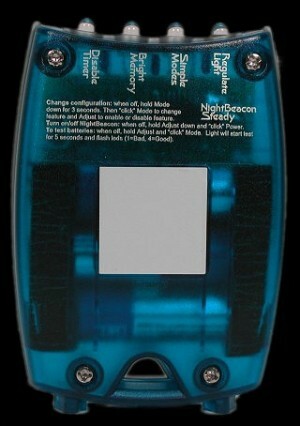 Exclusive NightBeacon(tm) feature lights body of light blue so it can be found easily in the dark. Small pocket-sized ergonomic shape is comfortable to hold. Measures only 2 5/8" X 3 5/8" X 1". Water resistant - see Statement of water tightness. Corrosion resistant standard size stainless steel machine screws. Powerful magnet allows for quick attachment to metal/magnetic surfaces. Large feet allow for upright room lighting. Extremely durable and impact resistant - see Statement of durability. Lanyard hole and safety-break-away lanyard for easy tethering. FLOATS in fresh and salt water as equipped with AA Lithium batteries. 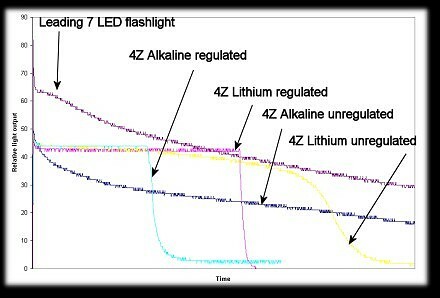 The top line in the graph is a leading 7 LED flashlight which takes 3 C batteries, is much larger and weighs almost 3 times as much. C batteries have almost 3 times the power of AA batteries. Yet, see how the EliteMax is actually able to out power a light with 3 more LEDs and 3 times more power for almost 2 hours! Oh, and that 7 LED light loses 22% of it's total light output in just 15 minutes! And, is down to 50% of its total light output in 10 hours! After 10 hours, the EliteMax still supplies 96% of its total light output! The EliteMax not only has power regulation, but can select regulation levels and can turn on and off regulation at will to get you the absolute best performance from whatever your battery situation is. Because of this, the EliteMax can also make use of rechargeable batteries without affecting its light output level like other lights. Thus, the same light output can be achieved from Nicad, NiMH, Alkaline and Lithium batteries. 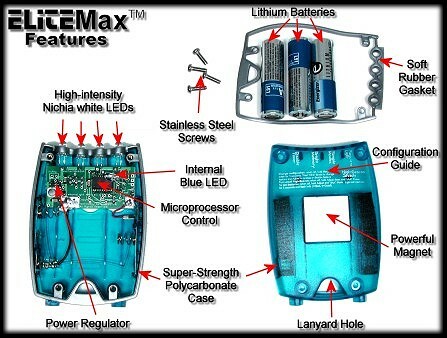 In fact, the EliteMax can even provide the same output level with just two batteries and a third dummy cell! Some users prefer a very simple operation without so many modes. Some prefer a light with a memory. Some want regulation and some don't. The EliteMax's clever configuration mode allows you to enable or disable some of the features you want or don't, whenever you want. 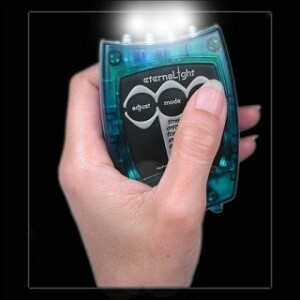 Yet another first for the EternaLight family, the EliteMax is the first flashlight ever made with a configuration mode! The EliteMax is not a flashlight for everyone. Although it is simple enough for a two year old to operate, it's sophistication and technical features can be overwhelming. 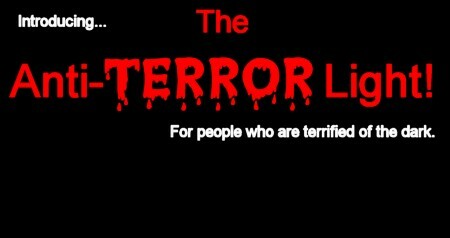 And, it is not cheap. But if you're looking for a total lighting instrument that fits in your pocket and is your best nighttime tool, nothing beats the MAX! Web price only $89.99 each!